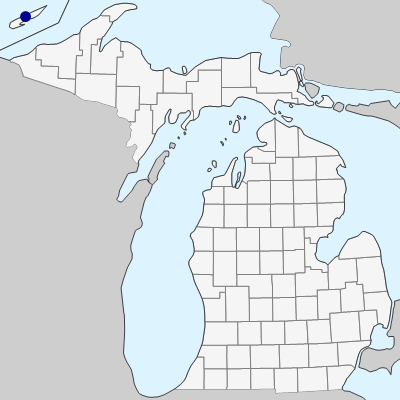 A boreal species ranging south in our area barely to Lake Superior, where it is frequent along the Canadian shore and apparently very local on rocky shores at Isle Royale. This variable species is often confused with others, especially S. discolor, with which it probably hybridizes. In its most distinctive form with highly glossy leaves and red-purple twigs, it is quite readily recognized. MICHIGAN FLORA ONLINE. A. A. Reznicek, E. G. Voss, & B. S. Walters. February 2011. University of Michigan. Web. April 20, 2019. https://michiganflora.net/species.aspx?id=2638.